CWA members from across the country gathered in New Orleans last week for the 2018 Civil and Human Rights Conference, presented by CWA's Women's Committee and Civil Rights and Equity Committee. 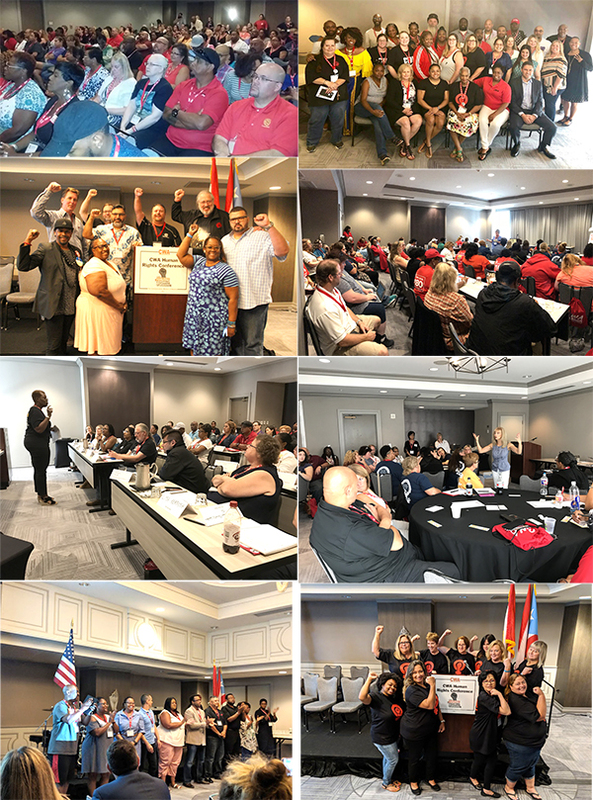 The four-day conference focused on CWA's efforts to make CWA STRONG by organizing and building working class power through local activism and mobilization, as well as CWA's Fight Forward towards social and economic justice. CWAers heard from speakers including CWA President Chris Shelton; Secretary-Treasurer Sara Steffens; District 6 Vice President Claude Cummings, Jr., who heads CWA's Human Rights Program; District 3 Vice President Richard Honeycutt; District 4 Vice President Linda Hinton; District 7 Vice President Brenda Roberts; Public Sector Vice President Brooks Sunkett; T&T Vice President Lisa Bolton; AFA-CWA President Sara Nelson; and IUE-CWA President Carl Kennebrew. "In CWA, we recognize that our diversity is our strength," said Shelton, firing up the attendees on Monday. "We are one Union. We are CWA. 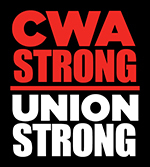 We are CWA STRONG!" Shelton urged CWA members to commit to spending every ounce of energy we have on taking back the House and Senate in 2018 in order to put the brakes on Donald Trump's attacks on working people. In discussing the racism that CWAers who are minorities experience, Shelton highlighted the story of Markeis McGlockton, the grandson of CWA Local 3179 Vice President Marcus Head who was murdered two weeks ago in Clearwater, Fla. McGlockton, who is African-American, was shot by a white man in a convenience store parking lot, with the county sheriff initially deciding not to press charges, citing Florida's stand your ground law. The week of the Human Rights Conference, the State Attorney overruled the sheriff and charged the shooter with manslaughter. "We see racism and sexism encroach into our workplaces in many ways," Shelton said. "And we must always fight it." District 6 Vice President Claude Cummings, Jr., spoke about recent CWA election victories in Missouri defeating a so-called "right-to-work" ballot initiative and electing CWA member Karla May to the State Senate. "We have 85 days until election day – judgement day," said Cummings. "If we are going to win in November, we have to mobilize the African-American community, and this is a good example of what can happen when we do." 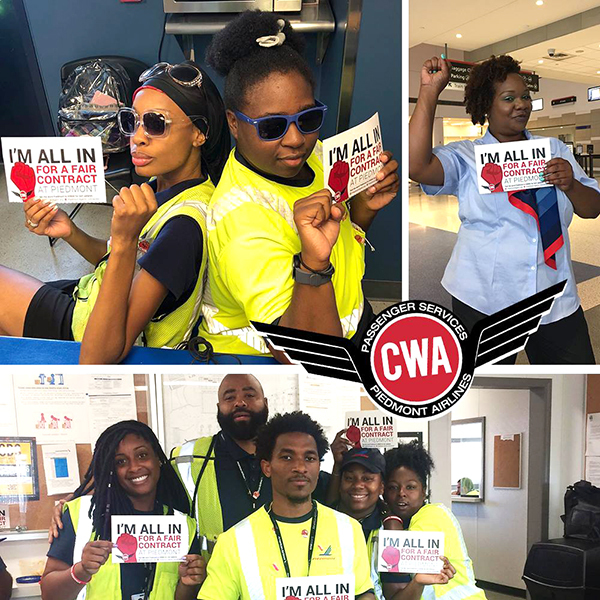 Assistant to President Shelton Ameenah Salaam led a panel featuring CWA Local 1180 President Gloria Middleton, CWA Local 3411 President Matt Wood, and UCW-CWA Local 3865 Vice President Margaret Cook, who discussed what they are doing at the local level to make the CWA STRONG program a success. CWA Secretary Treasurer Sara Steffens and AFA-CWA President Sara Nelson led a #MeToo workshop on how CWAers are addressing sexual harassment in the workplace and within the labor movement. Other workshops with packed rooms were held on criminal justice and police department reform, implicit bias, intersectionality, domestic violence, women in skilled trades, and getting union women to run for elected office, with attendees making enthusiastic commitments to get involved in their communities after the conference. At the Mary Mays-Carroll Awards luncheon on Tuesday, the CRE committee honored CWA Local 1180 President Gloria Middleton and the Women's Committee honored CLUW President Elise Bryant of TNG-CWA Local 32035. 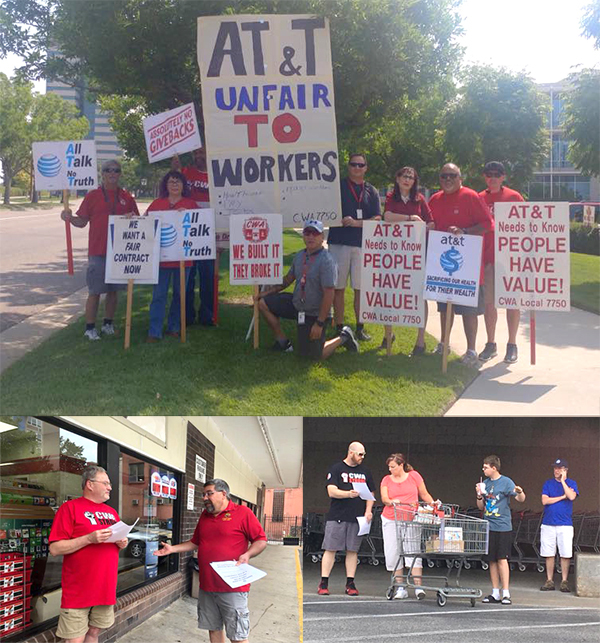 In the wake of the Janus decision, a right-wing attack on union fair share fees meant to make it more difficult for working people to defend themselves when corporations abuse their power, New Mexico Attorney General Hector Balderas issued an advisory last week reaffirming public sector workers' collective bargaining rights. The advisory emphasized that the only change under the Janus decision for New Mexico workers is that public employers may no longer deduct agency fees from a nonmember's wages. The advisory reaffirmed that public employees have the right to organize; the right to choose a labor organization; the right to join a labor organization; the right to engage in lawful, concerted activities for the purpose of collective bargaining; and the right to be represented by a labor organization of their own choosing for the purpose of bargaining collectively on questions of wages, hours, and other terms and conditions of employment. "Attorney General Balderas' advisory is an important reaffirmation of the collective bargaining rights that New Mexico public sector workers still have to join together in strong unions to speak up for themselves, their families, and their communities," CWA said in a statement. 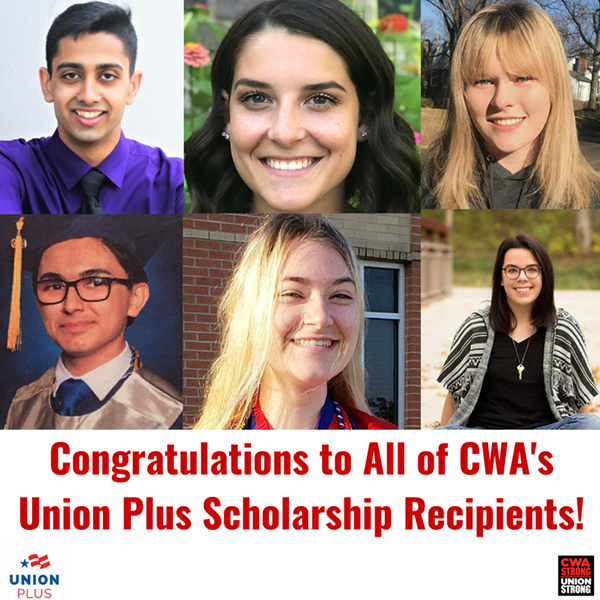 Union Plus has awarded $150,000 in scholarships to 115 students representing 32 unions, including six winners from CWA. Congratulations to the CWA winners! Anna Bryan of Kirkwood, Mo. Bryan, whose father, Bill Bryan, and mother, Kimberly Bell, are members of Newsguild-CWA Local 36047, has been awarded a $2,500 scholarship. Benjamin Falcon of Corpus Christi, Texas. Falcon, whose father, Benjamin Falcon, Jr., is a member of CWA Local 6186, and whose mother, Jennifer Falcon, is a member of CWA Local 6137, has been awarded a $4,000 scholarship. Olivia Gahan of Louisville, Ky. Gahan, whose father, Thomas Gahan, is a member of IUE-CWA Local 83761, has been awarded a $1,500 scholarship. Meeki Lad of Iselin, N.J. Lad, whose mother, Mina Lad, is a member of CWA Local 1032, has been awarded a $2,000 scholarship. Madison Metague of Richboro, Pa. Metague, whose father, David Metague, is a member of CWA Local 13000, has been awarded a $500 scholarship. Jacquelyn Trott of Tomball, Texas. Trott, whose father, Jason Trott, is a member of CWA Local 6222, has been awarded a $500 scholarship. The 2019 Union Plus Scholarship Application is now available here. The deadline to complete the 2019 application is January 31, 2019. 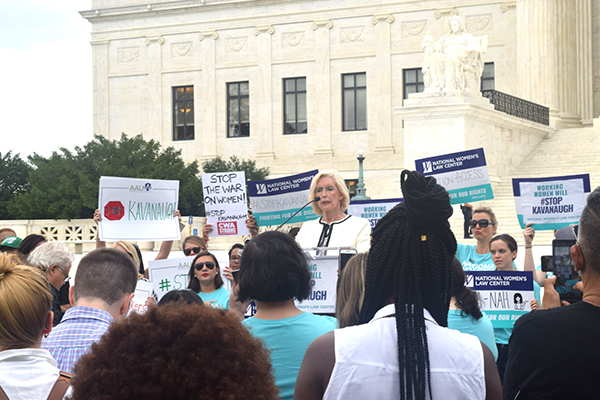 This week, CWAers joined allies for a rally on the U.S. Supreme Court steps to stand with and for working women to defeat Judge Brett Kavanaugh's nomination to the Supreme Court. Kavanaugh has a long record of routinely ruling against workers and their families and regularly siding with employers against employees seeking justice in the workplace – including CWA members. Kavanaugh's track record also shows hostility to government protections for workers, consumers, women, and fundamental civil rights.